Sudangrass (Sorghum bicolor ssp. drummondii (=Sorghum sudanese)) is a monocot weed in the Poaceae family. In Bolivia this weed first evolved resistance to Group A/1 herbicides in 1999 and infests Soybean. Group A/1 herbicides are known as ACCase inhibitors (Inhibition of acetyl CoA carboxylase (ACCase)). Research has shown that these particular biotypes are resistant to fenoxaprop-P-ethyl, fluazifop-P-butyl, haloxyfop-P-methyl, and quizalofop-P-tefuryl and they may be cross-resistant to other Group A/1 herbicides. This annual grass has relative tolerance to pendimethalin, clomazone, and acetochlor. With Eriochloa punctata it is the most predominant grass weed in soyabean, maize, and sugar cane. It has a wider range of adaptation compared to Eriochloa punctata. Greenhouse trials comparing a known susceptible Sudangrass biotype with this Sudangrass biotype have been used to confirm resistance. For further information on the tests conducted please contact the local weed scientists that provided this information. There is no record of differences in fitness or competitiveness of these resistant biotypes when compared to that of normal susceptible biotypes. If you have any information pertaining to the fitness of Group A/1 resistant Sudangrass from Bolivia please update the database. Background: The allelochemical sorgoleone, a major component of the hydrophobic root exudates of Sorghum bicolor, was formulated as a wettable powder [4.6 WP] and evaluated as a natural herbicide on several weed and crop species under different growth conditions. Results: Formulated sorgoleone [4.6 WP] suppressed germination and shoot growth of weeds, with broadleaf species showing greater susceptibility than grass weed species. Germination and growth of broadleaf weed species were completely suppressed (100%) at 0.2 g a.i. L-1 sorgoleone in a growth chamber study. Post-emergence applications of the wettable formulation of sorgoleone [4.6 WP] inhibited 20-25% higher growth of weeds than pre-emergence applications under greenhouse conditions. Broadleaf weeds were more susceptible than grass species to both methods of application. In all studies, growth was suppressed in more than 90% of the broadleaf weeds and two species, in particular, Rumex japonicus and Plantago asiatica, were completely suppressed at 0.4 kg a.i. ha-1 sorgoleone. The crop species, on the other hand, were much more tolerant to sorgoleone, with 30% inhibition, at most, at the highest rate of 0.4 kg a.i. ha-1 sorgoleone. Conclusion: The results of this study reveal that sorgoleone, after formulation as a WP, is more effective in inhibiting weed growth, and crop species are tolerant to it. The strong weed suppressive ability of formulated sorgoleone therefore offers interesting possibilities as an effective natural environment-friendly approach for weed management..
Asfaw Adugna ; Endashaw Bekele. 2013. Morphology and fitness components of wild × crop F1 hybrids of Sorghum bicolor (L.) in Ethiopia: implications for survival and introgression of crop genes in the wild pool. Plant Genetic Resources: Characterization and Utilization 11 : 196 - 205. Natural hybridization between wild/weedy and crop species often results in rare hybrids, which can be more weedy and difficult to control. Moreover, the advent of transgenic crop plants raises questions of biosafety risk assessment on the consequences of rare hybrids with possible fitness enhancing genes on the environment. This study aimed at measuring the fitness components of wild-crop sorghum hybrids for various juvenile survival and adult morphological and fertility characters as part of the risk assessment of transgenic sorghum in Africa where the crop was believed to have first domesticated and serves as the major staple. Out of a pool of hybrids made in 2010 from 23 wild sorghum accessions and two released cultivated sorghum varieties using hand emasculation techniques, seven were selected for the field study of their fitness components in 2011. The study confirmed that crop-wild hybrids of sorghum are fertile. Two approaches were followed (relative fitness and mid-parent heterosis) which showed that most of the hybrids were as fit as their wild parents, and in some cases they showed mid-parent heterosis for the measured traits. The results of this study highlighted a potential risk that hybrids carrying crop genes (including herbicide resistance transgenes) could pose because they could be more weedy than their wild/weedy parents if transgenic sorghum is deployed in regions where the wild and cultivated sorghum populations coexist, such as in Ethiopia and in other parts of Africa..
Li Gang ; Wang QiAng ; Cai LeiMing ; Wu ShengGan ; Zhao XuePing ; Wu ChangXing. 2013. Cloning and expression of quinclorac-induced transcriptal factor EcMYB1 in Echinochloa crus-galli. Journal of Agricultural Biotechnology 21 : 1166 - 1175. 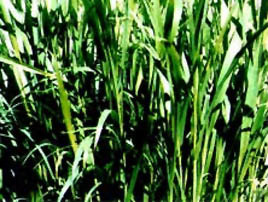 Echinochloa crus-galli is one of the most noxious grass weeds in Chinese rice paddies, which has evolved resistance to quinclorac after continuous application since 1990. But little is known about its resistance mechanism. In order to explore the mechanism involved, we described isolation and mRNA expression of a quinclorac-responsive gene MYB in E. crus-galli. Transcriptal factor MYBs played important roles in regulating plant growth and development and withstanding environmental stresses. But, little is known about expression profile of MYBs mRNA in herbicide-resistant barnyardgrass (E. crus-galli) under quinclorac stress. Ahomologue sequence of MYB was obtained from quinclora-resistant-identified E. crus-galli using RACE(rapid amplification of cDNA ends). The gene, designated EcMYB1 (GenBank accession number: JX518599) with whole length 1 844 bp, had a 1 527 bp open reading frame predicted to encode a protein of 508 amino acids with molecular weight 55.4 kD and isoelectric point 8.6. The predicted EcMYB1 contained three conserved MYB domains that make the EcMYB1 belong to the R1R2R3 gene family which was not common in plants. Based on phylogenic analysis of protein sequence between EcMYB1 and others MYB, EcMYB1 had the closest relationship with the MYBs of gramineous plants, such as Sorghum bicolor, Zea mays. The result of whole-plant dose-response experiments demonstrated that the near iso-genicline material used in this study was susceptible or resistant to quinclorac. The GR50 (for 50% growth reduction) was 158.3 g.AI/hm2 for quinclorac-susceptible (S) biotypes or 858.0 g.AI/hm2 for quinclorac-resistant (R) biotypes. Ratios (R/S) of GR50 value was 5.4. EcMYB1 transcriptional expression was monitored in seedlings (leaves and roots) and adult plants (leaves, roots, stems and seeds) of R and S biotypes of E. crus-galli through Real-time PCR experiment with EcActin (GenBank accession number: HQ395760) as the reference sequence. The relative expression of EcMYB1 in transcriptional level was 26.22~52.50 in R biotypes and 6.85~34.62 in S biotypes, such as 52.50 in leaves of seedling of R biotypes and 6.85 in leaves of S adult biotypes, and 1.22~4.78 times greater in the R plants than that in the S plants. After exposure to quinclorac, its increased relative expression was 189.66~395.45 in R biotypes and 61.91~144.29 in S biotypes, such as 395.45 in roots of seedling of R biotypes and 61.91 in stems of S adult biotypes, and 2.46~4.06 times greater in the R plants than that in the S plants. Its expression was higher in all tissues tested of R biotypes than in that of S plants before or after quinclorac treatment. The difference expression of EcMYB1 mRNA in R and S biotypes suggested that EcMYB1 maybe involve in resistance to quinclorac in E. crus-galli. The results of this study provide basic information for the further research of function of the EcMYB1 in resistance to quinclorac in barnyardgrass..
Kershner, K. S. ; Al-Khatib, K. ; Krothapalli, K. ; Tuinstra, M. R.. 2012. Genetic resistance to acetyl-coenzyme A carboxylase-inhibiting herbicides in grain sorghum. Crop Science 52 : 64 - 73. Weed management is one of the most important considerations impacting sorghum [Sorghum bicolor (L.) Moench] production in the United States today. The objectives of this study were to evaluate the level of resistance, type of inheritance, and causal mutation of wild sorghum accessions that are resistant to acetyl-coenzyme A carboxylase (ACCase)-inhibiting herbicides compared to susceptible grain sorghum seed parents. Acetyl-coenzyme A carboxylase-inhibiting herbicides used in this study were fluazifop-P and quizalofop-P from the aryloxyphenoxypropionate (APP) family and clethodim and sethoxydim from the cyclohexanedione (CHD) family. Dose-response studies indicated the level of resistance was very high for APP herbicides but low to nonexistent for CHD herbicides. Estimates of the resistance factors to APP herbicides based on herbicide rate required for 50% growth reduction (GR50) were 54 to 64 for homozygous plants and 9 to 19 for heterozygous plants. Resistance to CHD herbicides was very low with resistance factors ranging from one to about five. Genetic segregation studies indicated a single gene is the cause of resistance to APP herbicides. Polymerase chain reaction (PCR) amplicons from the carboxyl transferase (CT) domain of the chloroplast directed ACCase gene were sequenced and a single point mutation that results in a cysteine replacing tryptophan (conversion from tryptophan at amino acid position 2027 to cysteine [Trp-2027-Cys]) was discovered. Given the high level of herbicide resistance and simple inheritance, these sources of APP resistance may provide useful herbicide resistance traits for use in sorghum..